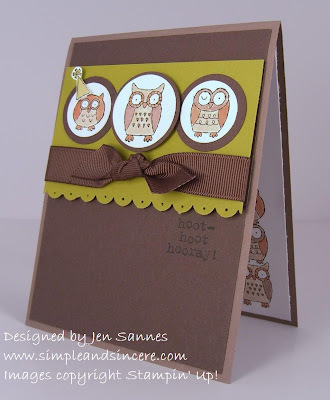 Simple & Sincere: Hoot, Hoot, Hooray! Today's card was inspired by Fall to Layout #41 from the Clean & Simple Stamping blog. I love these little owls - aren't they too stinkin' cute? :) I think this would make an excellent masculine birthday card. I decided to do something fun on the inside of the card, too. Makes it even more special! It was actually pretty easy to stack up the owls. I just eye-balled it, no SAMJ required. So, are you wondering what tomorrow's giveaway will be? The winner of tomorrow's blog candy giveaway will receive the Live Like You Mean It stamp set and the Patterns Pack II 6x6 designer paper (colors include Regal Rose, Apricot Appeal, Brocade Blue, Basic Gray, and Garden Green). Be sure to stop by and leave a comment and you'll have a chance to win! Love this card. I especially love what you did on the inside. I love the colour combo! It looks very nice. 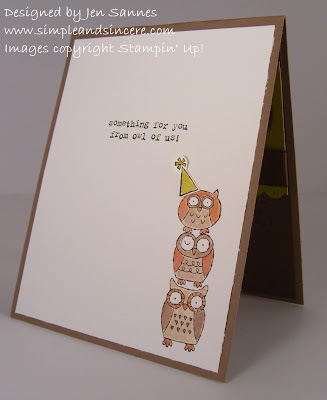 I like how you 'totem-poled' the owls inside the card! You did a GREAT job stamping even without using the SAMJ!! This is a great example of a masculine card, love how you did the inside too!